All-white color palettes have been the hit of the style world for some time now, but they're still appealing for one key reason: the bright shade does wonders for details. Take this example from Kapito Muller, which showcases the beauty of this hue in a calm, luminous dining area. Plenty of natural light gives the minimalistic decor a cheerful assist, while a marble backsplash enhances it all with a quiet touch of high-end luxury. Meanwhile, the dark-lined print provides a contained hint of color, and mirrors the marble veins of the backsplash nearby. While white or clear chairs could have been an option for this space, we're psyched that the scheme went with this option instead. The pair of woven seats brings in a symmetrical finish that foils the artwork, color that matches the floor, and texture that contrasts the smooth table. It's a duo that pulls triple duty on a clean backdrop, and it's a simple item to duplicate when you want to make this beloved trend your own. 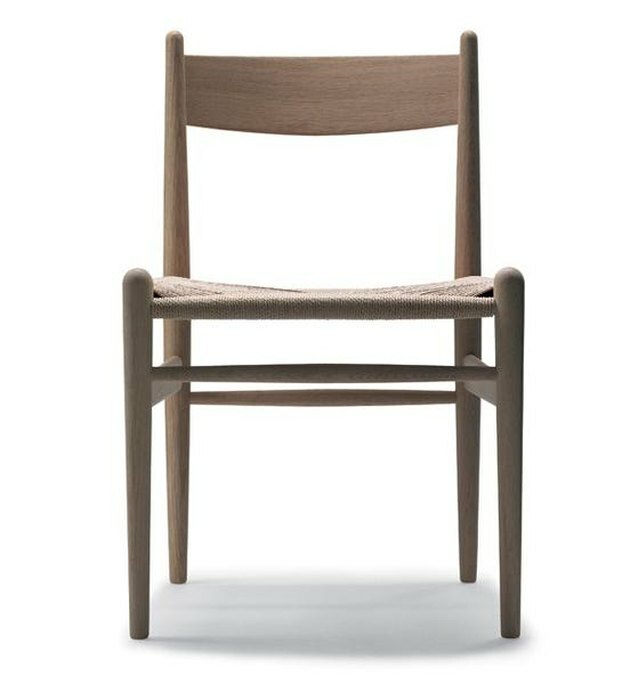 Instantly warm up your space with a pair of these Hans Wegner woven chairs.